Our God is the Master of surprises! Over the years I have learned to appreciate new beginnings. It can be sad or upsetting to leave behind the familiar and embark on uncharted paths, but every new turn offers us possibilities not known or realized in the past and surprises known only to God...and God is truly a God of Surprises. So this new year holds out for us many opportunities to grow as human beings, as Christians and as friends of Jesus! To sit in the divine presence of Jesus as I try to do each day can be an eye-opener. If we bring to the Lord all of our hopes, our dreams and plans, our concerns and worries, our failures and disappointments, we can begin to see all of this in light of God's plan and His will for our lives. To try and makes sense of the complexities of life, the ups and downs of being the person God made us to be, the challenge of being Catholic disciples of Jesus - all of this can be overwhelming left on our own. But when we do this consistently in prayerful conversation, speaking and listening in our quiet "inner room," God does open our eyes to the meaning of our lives. As we begin yet another new year, the common human experience is that times just goes faster and faster. We all think, "Where did last year go?" In the midst of the rush, the continual movement forward in time, forward towards our meeting with God face to face, we are blessed with time. In His patience God has given us more time to become who it is He created us to be. This we cannot do alone or in a vacuum. And so, The CatholicTV Network is there for you, seen in more than 11 million households. You are never alone: the Lord Jesus is with you and you are part of a wonderful family, the CatholicTV family. We are all God's dear children and we are loved beyond measure. May 2012 be a wonderful year for you, even if it brings challenges and change...for one thing is certain: God's deep love for us in Jesus Christ will never change. This is no surprise - Jesus is the same for us and for all: yesterday, today and for eternity. Happy New Year, everyone! May it be full of great surprises. Bonnie and I had the pleasure of appearing on The Good Catholic Life on Boston's 1060AM, The Station of the Cross last night. Hosted by RCAB's Secretary for Catholic Media Scot Landry, The Good Catholic Life is a show for Bostonians by Bostonians about living a good, joy-filled, holy Catholic life here in Boston. Scot is joined by a different co-host every day, and we were privileged to be on the show with Father Matt Williams, the Director of the Office for New Evangelization of Youth and Young Adults. Bonnie and I got the chance to talk about CatholicTV's great programming, in particular ChristmasTV, which starts at 8:30 every night, until the 24th, 25th, and 26th, when it lasts all day in our 3-day ChristmasTV Marathon. Turn your TV on as you enjoy Christmas with your family, and listen to the great music and family friendly programming on ChristmasTV. Be sure to join us for the Midnight Mass at the Basilica of St. Peter (at Midnight! ), or for the 10AM (ET) Mass at Notre Dame's Basilica of the Sacred Heart. ChristmasTV continues for all 12 days of Christmas. We also spoke about our exciting new venture, The Gist, a new kind of Catholic program for women. CatholicTV Producer Kate Andrews has been working hard on this project, and we hosted Rachel Balducci, Danielle Bean and Carolee McGrath two weeks ago for our first round of shooting. The show premieres in January, so stay updated by checking it out on Facebook and Twitter. Finally, Bonnie and I talked with Scot and Fr. Matt about CatholicTV's efforts to provide content across all media. An integral aspect of the New Evangelization is meeting people where they are, and CatholicTV truly strives to do that with our website and mobile livestream, mobile apps, Facebook, Twitter and Youtube pages. Be sure to like/follow/subscribe to us for the full CatholicTV experience. We are always exploring new platforms on which to offer our content, so stay tuned for updates in the (near) future! 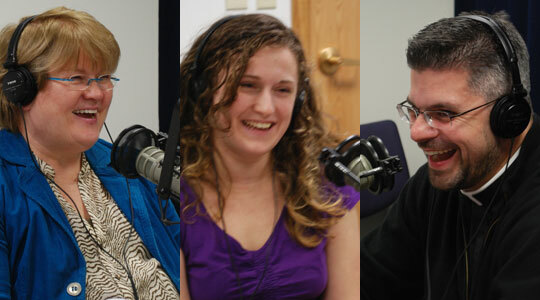 If you missed Bonnie and me on The Good Catholic Life, you can listen to the show right here. Live on Thursday, December 8, , at 2 PM (ET), The CatholicTV® Network will broadcast the installation Mass of Bishop Peter Libasci as the 10th bishop of the Diocese of Manchester, NH. The Mass will be celebrated at Saint Joseph Cathedral with Cardinal Sean O’Malley and other bishops in attendance. Since his ordination as bishop on June 1, 2007, Bishop-designate Libasci has served as the Episcopal Vicar for the Eastern Vicariate of the Diocese of Rockville Centre. Born November 9, 1951 in Queens, N.Y., Bishop Libasci attended Catholic schools throughout his childhood and attended seminary at Saint Meinrad Seminary, Indiana. He was ordained a priest of the Diocese of Rockville Centre on April 1, 1978. On December 10, 2004, Father Libasci was named Honorary Prelate to His Holiness Pope John Paul II with the title of monsignor. On April 3, 2007, His Holiness Pope Benedict XVI appointed Rev. Msgr. Libasci auxiliary bishop of the Diocese of Rockville Centre. He was installed on June 1, 2007. Biographic summary, pictures, and a statement from Bishop-designate Libasci and Bishop Murphy will be available on the Diocese of Manchester website: www.CatholicNH.org.